OK, this is definitely not my most Pollyana moment, but it just needs to be said. I will preface this by saying that I believe that most people genuinely mean well. Their intentions are good. But, there were times when I was tired and frustrated and people, probably thinking that they were helpful, offered suggestions or opinions that were inappropriate or out of touch or thoughtless. There were times when people were judgmental and insensitive. There were times that they would speak about Ben, in front of him, as if he was not capable of an opinion (he was very capable of opinions and he had many!). 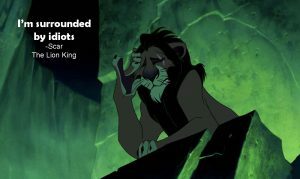 In those moments, I secretly resorted to a mental image of Scar saying, “I’m surrounded by idiots” while I smiled and nodded and exited the situation as soon as possible, to avoid an argument or a pointless conversation. Try it. Summon your best Jeremy Irons impersonation-even if it’s only that little voice in your head- the next time you hear someone offer up some ridiculous unsolicited advice or misinformation and you don’t want to lose your temper. You’ll thank me. You’re welcome!